Shirt "Mold" ...It ain't pretty! Originally uploaded by Pamela I. E.. Originally designed for a musician who needed both high style and comfortable ease of movement, THE BACHELOR PLEAT (tm) has become a favorite of many OTC clients...bankers, brokers, golfers, and musicians alike! Gosh, even engineers like it! This carefully engineered back pleat can be added to any OTC design. The BACHELOR PLEAT (tm) is perfect for the needs of the average bachelor: Throw it in the washer, take it out of the dryer, and wear it with style! Care to tell us your method for doing this pleat, or is it a trade secret? 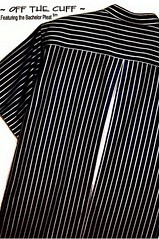 Oh, and is that a contrasting fabric that's showing in the pleat opening? Sorry....it *is* a trade secret. :) But...readers of Sewzine know the basics of the Bachelor Pleat construction, as I wrote an article about it for that magazine. And yes, there is a contrasting fabric inset within the pleat. What is the Sewzine magazine? Don't think I've seen it before. Where do you get it and what issue is it in? I like this! I am a big fellow, 52" chest, and this would definitely give me some freedom of movement.